On October 11th, 2014 from 2-5PM there will be an Altar Boy Retreat. We ask that any young gentleman who will be an Acolyte/Altar Boy for the 2014-15 year to attend. Please spread the word to families who might want their son to become an acolyte here at St. Demetrios. At our retreat, we will have what is called a Teaching Liturgy. 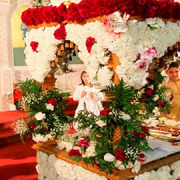 We will actually celebrate the Liturgy all together and we will learn about the Liturgy as well as all the essentials of being an Acolyte from the robes that we wear, to the processions and movements of Liturgy done by the Acolytes and the Priests. It will be a wonderful opportunity for prayer, love, fun and fellowship together. More information and details will be announced at later date! If there are any questions or suggestions please do not hesitate to email me or call Sampson 954-467-1515. Come “Be Yourself” with IV on the Go and St. Demetrios!!! Participants will experience a fun, exciting retreat run by former and current members of the Ionian Village Staff. Just like at Ionian Village Camp, participants will encounter our Orthodox faith in an up close and personal and unforgettable way. Ionian Village has always been a program that you travel to and while they can’t possibly transport the entire country of Greece, they realize that they can travel with their enthusiasm and energy to bring the Ionian Village experience to as many young people in our hometown! This year’s retreat theme is “Be Yourself.” You are your true self the most when you are around the Faith, the Church, and friends from Church. You can carry the faith with you always so that you do not follow in the wrong footsteps, but better yet, create your own and follow your true self! The time is upon us again this year to begin our ministry programs. As you know in an effort to encourage and answer all your questions we have an Orientation Day. 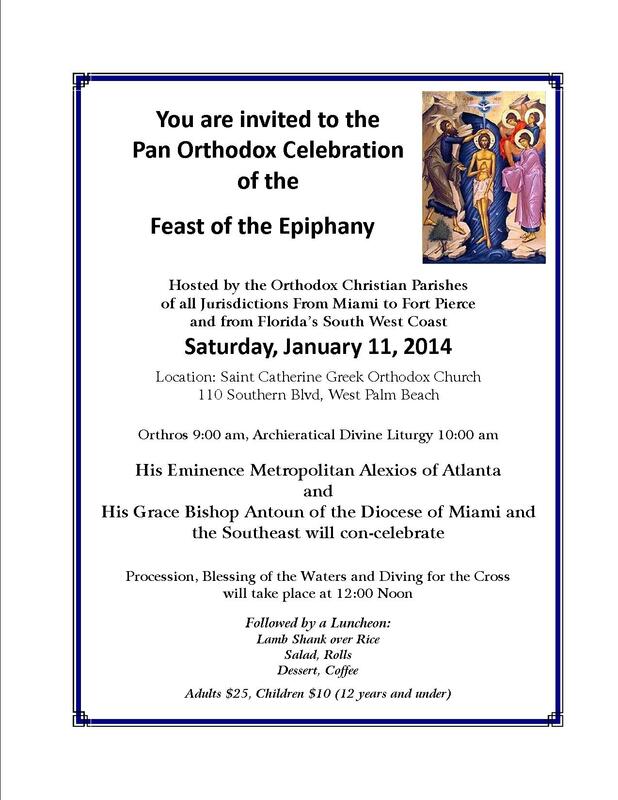 This years date is August 24th immediately following Divine Liturgy in the hall. 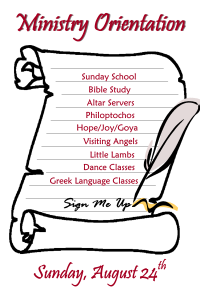 Please bring your family to register for our ministries as well as interact with the leaders of each organization. We look forward to seeing you all there! 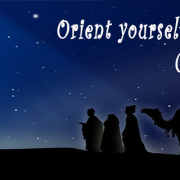 https://stdemetrios.org/wp-content/uploads/2014/08/three_kings_of_Orient_706x320.png 320 706 Fr. John Codis https://stdemetrios.org/wp-content/uploads/2014/11/St_Demetrios_Logo_reverse_text_with_015488_190x60_border.jpg Fr. John Codis2014-08-06 14:38:322014-08-06 15:37:47Ministry Orientation Day! Join us for an unforgettable voyage on the beautiful MSC Divina, sailing from Miami on December 27, 2014 and returning to Miami on January 3, 105. 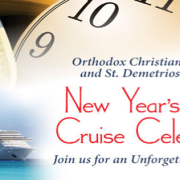 Not only will you enjoy ushering in the New Year at sea, but you will also have the opportunity to visit with other Orthodox cruisers, listen to featured speakers, and support St. Demetrios and OCN simply by taking this exciting journey. Click the link below to learn more about the cruise and how you can reserve your cabin now. Cabins are selling quickly, so please reserve yours as soon as possible to ensure that you will be able to attend. There will be a Special Egg hunt and face painting! Also available will be the Traditional Easter Soup (Magiritsa) on sale for $5 a pint. Entertainment services provided by DJ Jimmy! You’re invited to join us for our Christmas Wonderland Gala. 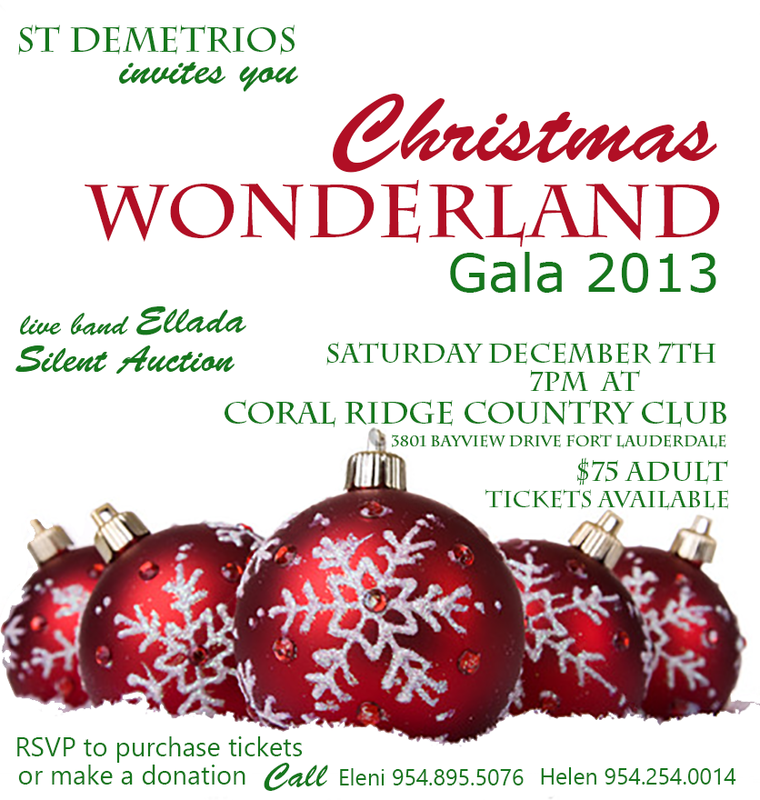 We are excited to announce that St. Demetrios will host a Christmas Wonderland Gala on Saturday, December 7th at the Coral Ridge Country Club. Our guests will enjoy a wonderful reception, live band, and a fun-filled silent auction, at this wonderful Florida Christmas Wonderland. We would like you to consider donating auction items or monetary gifts to sponsor the event as an end of the year gift. The Christmas Gala will be advertised throughout the Greek Orthodox Parishes in South Florida – and we are expecting to host over 200 guests from the community and beyond that evening. Your business or family will be recognized for its contribution in our event program. All proceeds from the event will benefit the parish ministries. For more details, please contact the church office or one of the event committee members listed below. We ask that you please print the attached donation form and return it with your donation. St. Demetrios church will return a copy for your records. All donations are tax deductible. Receipts will be provided All donations must be submitted by Sunday, November 24th to be included in the program. Thank you in advance for your support. We look forward to adding you to our list of donors, and hope that you will be able to join us for this wonderful event! The following is a wish list for auction donations. If you are able to donate any of the following, please fill out this form, and turn it in to the committee. The items can be dropped off to the church office or you can call 954-467-1515 for someone to pick them up. (No need to wrap anything.) If you wish to put together a basket with a friend let us know if you need suggestions! Deadline is November 24th. Feel free to be creative. Try to think of something that would make a great Christmas gift! All donations are tax deductible. Receipts will be provided.